Passengers on board a train which hit a car on a level crossing killing a teenager and his grandad have spoken out about what they saw. They told an inquest into the deaths of 15-year-old Will Hallett and his grandfather Barry Hearnshaw, 71, they heard a loud noise and saw a ball of flames as the train came to a halt. Barry had been giving his grandson Will a lift to a football match in his Kia Rio car when the crash happened at Barns Green level crossing at 8.38 am on February 17 last year. Train passenger Joseph Waniszyn was on his way home to Pulborough from working in London. “I heard a noise then saw a flash of flame at the side of the train. I thought the train had come off the rails,” he said. Jurors heard that the automatic half barriers and warning lights on the crossing had been working normally before the crash. The inquest heard that a train data storage ‘black box’ had been destroyed in the fire that followed the crash. 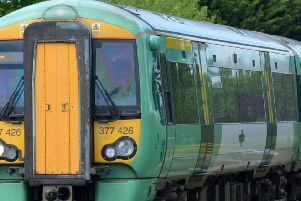 Christopher Ford, of the Rail Accident Investigation Branch, said there was ‘strong evidence’ that the barriers and warning lights had been working normally, but there was no definitive proof. However, relatives of the victims questioned whether there could have been a signal failure or other fault. They said there were instances of such since the crash, around last Christmas and again earlier this month. Consultant pathologist Dr Ali Alhakim said both Will and Barry would have died instantly. Barry, he said, died from multiple injuries and Will died from a head injury. Earlier, the inquest heard that Barry was a careful driver and would not have consciously put the life of his grandson or his own at risk. Will’s mum Jilly, in a statement, called for the barriers to be made safer. She said she was appalled that the crossing was back in action soon after the accident. “I make a point of not using it. I am very concerned that they have not installed full barriers,” she said.